Indonesia’s economy may be cushioned by its huge domestic market as a trade dispute between the U.S. and China poses risks to the global economic recovery, according to Finance Minister Sri Mulyani Indrawati. In its latest mea culpa, social media giant Facebook has admitted that the number of its users whose data was improperly shared with British political consulting firm Cambridge Analytica was in fact 74 per cent higher than previously thought, now exceeding 87 million people. Through a partnership with Taiwanese company Controlnet International Inc, the Village Unit Cooperative (KUD) Parent or Induk KUD buys environmentally friendly energy with an investment value of IDR13 trillion. Indonesia’s state-owned Pertamina has slashed its imports of condensates in recent months by at least half as it cuts operating rates at the country’s sole condensate splitter, trading sources said on Thursday. BRISyariah, a subsidiary of state-owned lender Bank Rakyat Indonesia (BRI), is seeking to raise between $94 million and $119 million through an initial public offering (IPO) after announcing that it will offer its shares at a range of Rp 505-Rp 650 apiece. PT Tiphone Mobile Indonesia Tbk (IDX:TELE) will issue bonds through a sustainable public offering (PUB) scheme worth up to IDR2 trillion this year. Several pictures and videos showing holes in the ceiling and water on the floor of the lobby of the Indonesia Stock Exchange (IDX) building went viral on social media on Thursday afternoon. Despite years of reasonable economic growth, 19.4 million Indonesians are still unable to meet their daily dietary needs. Dozens of residents opposed to the construction of the New Yogyakarta International Airport (NYIA) in Kulon Progo occupied the Yogyakarta branch office of state utility company Perusahaan Listrik Negara (PLN) during a rally on Thursday. The South Tangerang administration is expecting to collect more revenue from public cemeteries. 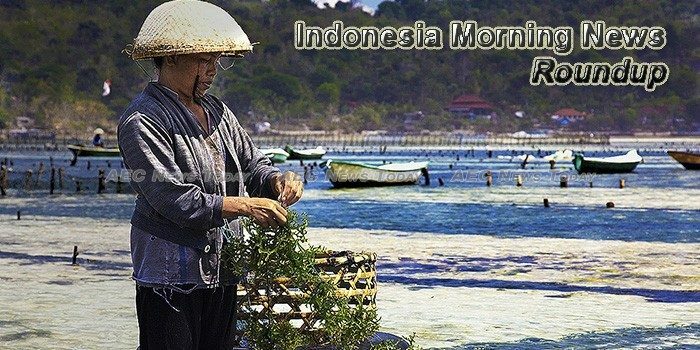 When Indonesia’s Constitutional Court decided to allow followers of Indonesia’s numerous indigenous faiths (collectively grouped under the term Aliran Kepercayaan) to declare their beliefs on their official state ID cards in November, it was hailed by many as an important step towards combating religious persecution in the country. Minister of Social Affairs, Idrus Marham ensured that the government will continue to push for lower poverty rate to below 10 percent. Indonesia stocks were higher after the close on Thursday, as gains in the Infrastructure, Basic Industry and Mining sectors led shares higher. Relations between Indonesia and Russia seem to be getting closer and closer as top officials agreed to speed up the drafting of a new strategic partnership agreement in Moscow last month. Real Estate Indonesia (REI) in Nusa Tenggara Timur (NTT) is targeting to build 3,000 houses by 2018, although up to now only 340 houses have been built. Lauhin Mahfudz and Ahmad Farhan Tsani of Indonesia finished second behind the Philippines in the international Qur`an recitation competition held in Cairo, Egypt. An application dubbed Safe Travel is ready to be launched by the Minister of Foreign Affairs next week on Saturday, April 14, in a shopping mall in West Jakarta. Rupiah exchange rate traded interbank in Jakarta on Thursday (4/5/2018) afternoon moved down by eight points to IDR13,762 compared to the previous position of IDR13,754 per US dollar. The Energy and Mineral Resources Ministry announced that Indonesian Crude Price (ICP) rose in March. At the ministry`s official website, March`s ICP was recorded at US$61.87 a barrel, inching up from February’s US$61.61 per barrel. Consumer credit has been the driver for credit growth in Indonesia’s banking sector in the first two months of 2018. With gaining confidence in locally produced creative content, the Indonesian government is setting its sights on expanding its market by pushing for an increase in book rights sales on the international stage. The Indonesian government will apply strict environmental and fire readiness testing to pulp and paper firms before they will be granted new concessions under a controversial land swop scheme that aims to get the companies off carbon-rich deep peatlands, a senior official said on Thursday (April 5). PT Mitra Adiperkasa, the Indonesian operator of global brands including Starbucks, Zara as well as Marks & Spencer, is predicting that a recovery in consumer spending will sustain its highest revenue growth in three years. Indonesia’s central bank will give banks greater flexibility in managing liquidity and credit in new rules announced on Thursday that are aimed at getting banks to lend more, officials said. Coffee trading in Indonesia was robust this week during a mini harvest season, while Vietnam coffee exports were seen falling from a month earlier as both demand and supply thin out, traders said on Thursday. One of Indonesia’s most respected Islamic clerics has issued a call for calm as religious conservatives attack the daughter of the nation’s first president, Sukarno. When Jokowi came to office in 2014, he promised to jump start Indonesia’s lagging infrastructure development. It has been a decade since successive Indonesian governments began devoting 20% of the national budget to education. State-owned Bank Mandiri said Bank Indonesia (BI) and the Financial Services Authority (OJK) need to continue to work on the regulation and oversee the financial technology or Fintech.